A Group Exhibition by HONEYCOMB. 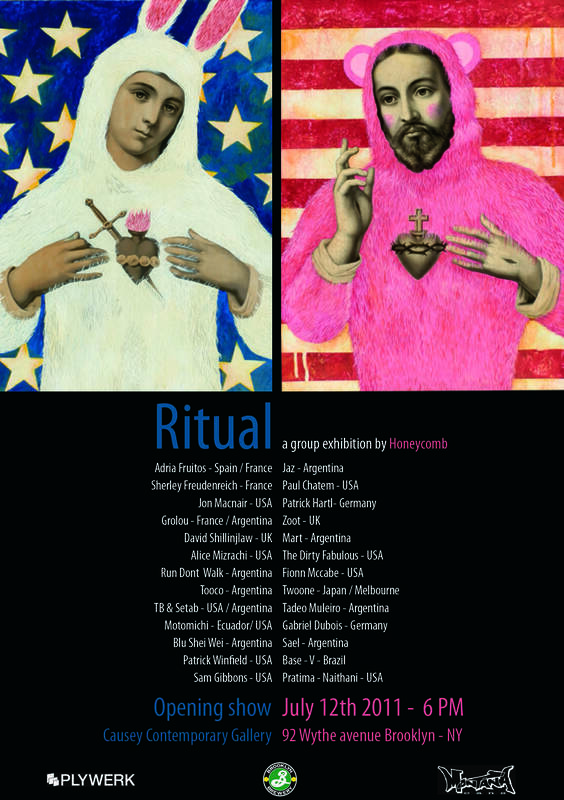 HONEYCOMB and Causey Contemporary Gallery proudly present Ritual, a group exhibition featuring original artwork produced by over twenty of the freshest urban, newbrow, young contemporary artists hailing from seven countries. Ritualistic behavior is one of the few things that have universally permeated all human sociological development. It has helped form civilizations, spawned entire belief systems, and through the ages has continuously influenced human conduct while simultaneously shaping the world as we know it. While the actual processes may vary, the incorporation of ritual into society is something that transcends nationality, geographic location and linear timeline. Cultures of both the past and present have used symbolic, traditional or religious rituals for any number of reasons including divination, personal pleasure, the achievement of spiritual or emotional needs, the formation of social bonds, expressions of respect and devotion, the advancement of social status, acceptance or for educational purposes. Although there are great differences among the countless rituals in existence, it is evident that regardless of intent or appearance, ritualistic behavior is undeniably intertwined with both our past and our future, and something that unites us all. Ritual will be on-view July 12 – August 28, 2011. Summer Gallery hours are Wed. – Fri. 11 a.m. – 6 p.m. Sat and Sun. 12 – 6 p.m. And Mon. 9 a.m. – 4 p.m.
170 S. La Brea Ave.
Just a quick note. 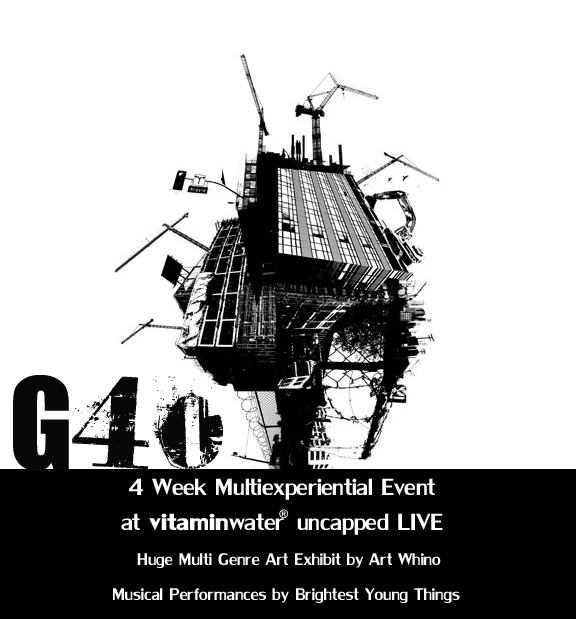 I will be in Washington DC this weekend, May 20-21 for the art exhibition “G40“. I’ll be showing a HUGE 16×8 foot mural as well as various paintings. The mural is the largest thing I’ve ever painted and I think it turned out pretty cool. Agh! Nada de películas de terror en el desayuno!-grité a mi novio mientras me tapaba los ojos con las manos y apagaba el televisor. Lo admito, soy de esas personas que no encuentra motivos para pagar la entrada a la casa del terror en el parque de atracciones. Es más, hasta mi adolescencia más madura no fui capaz de ver E.T., sobre todo por la escena de los lacasitos al principio de la película, cuando el espectador sabe que habrá un susto y, en cierta medida, disfruta de esa tensión. Lo confieso, la primera vez que eché un vistazo a las fotografía de Joshua lo hice por unos cuantos minutos, repitiéndome en todo momento que se trataba de composiciones teatrales donde ninguno de sus componentes sufre ninguna clase de daño. Después de un estudio de su amplia presencia en la red, y sobre todo, a la entrevista que ahora os presentamos, entendí que el género de terror es un buen camino para el conocimiento de las dobleces del Ser Humano. Los cuentos de hadas tienen una lección que va más allá de las moralejas, del clásico “no vayas sola al bosque”. Los cuentos preparan a los niños para las vicisitudes de la vida que afrontan. Una historia tan aparentemente simple como la de Caperucita Roja, advierte sobre los lobos con piel de cordero que confunden a lo largo de la vida. Tan recurrentes son estas situaciones y, sobre todo andamos con los ojos vendados a las experiencias que, una vez crecidos, necesitamos la misma moraleja en las películas de terror. El final feliz que nos hace sentir seguros en la infancia, no existe una vez crecidos. La vida es así, habrá otros lobos con piel de cordero. Joshua comenzó fotografiando cualquier cosa que le reportase dinero. Bueno, miento, antes se graduó en Filología inglesa, de ahí su posible interés por este tema. Luego, siguió su sueño, no sin antes haberse rodeado de maestros, de la fotografía, del cine, que han ido pavimentando su camino hacia el arte. De entre ellos destaca Richard Grosko, también mentor de uno de sus maestros, Nick Vedros. Del primero aprendió a perseguir su sueño, separando los trabajos alimenticios de aquellos que se hacen por amor al arte. Entendiendo que el dinero sirve para sus composiciones elaboradas, de set de cine. Los siguientes pasos en el mundo de la fotografía? Los podemos ver en su web. La venta de impresiones online, la joyería terrorífica pero lo que destaca sobre lo demás es la mejoría en la elaboración de sus teatrales imágenes. Sin embargo, su mente mira más allá, y eso puede ser por su adoración por las películas de terror: después de imaginar large scale productions, dentro de 10 años puede que se esté dedicando al cine. Does your interest in images of horror have anything to do with your studies in English Literature? They are related. 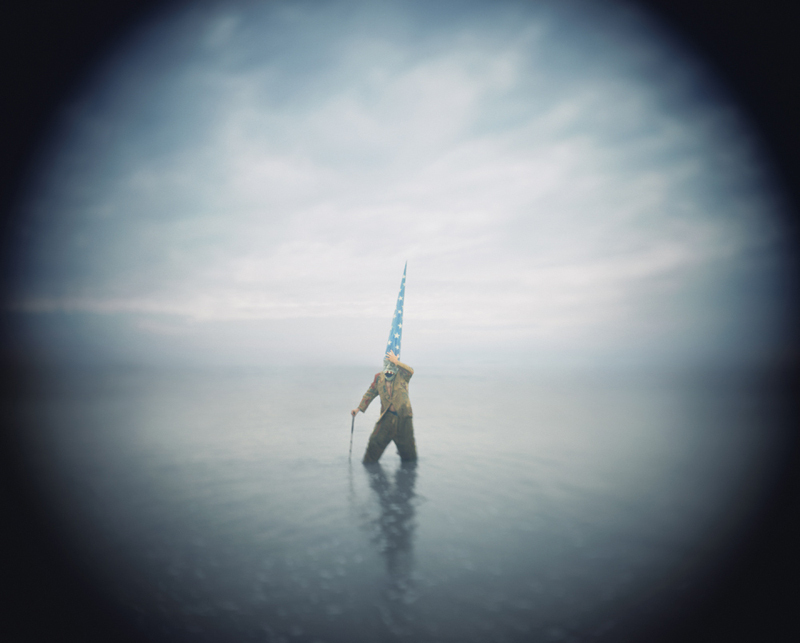 I was looking for a way to make metaphorical narrative-based photographs that employed archetypal images. My search led from fairy tales to Horror stories. There is a metaphoric capability to the Horror genre that can accommodate complex themes in a comparatively straightforward and all-encompassing way. What was the trigger to leave the job of wedding photographer to pursue your dreams of art photography? I still shoot weddings on occasion. I enjoy any opportunity to make money with photography. But I always make my personal work my priority. Follow your bliss. 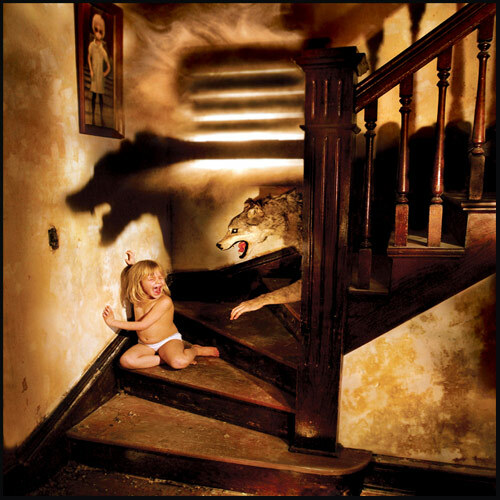 What are the metaphors behind your images? They relate the potential dangers of the world in symbolic form. A common metaphor I use is the boogeyman as a child molester. Many classic fairy tales, such as Little Red Riding Hood, Hansel and Gretel, and Bluebeard, function as cautionary tales about the potential dangers of the world. Likewise, so do many Horror films. The dangers of the world are represented symbolically or metaphorically – as monsters, ogres, trolls, child-devouring witches, and so on. The same also can be said for Horror films. 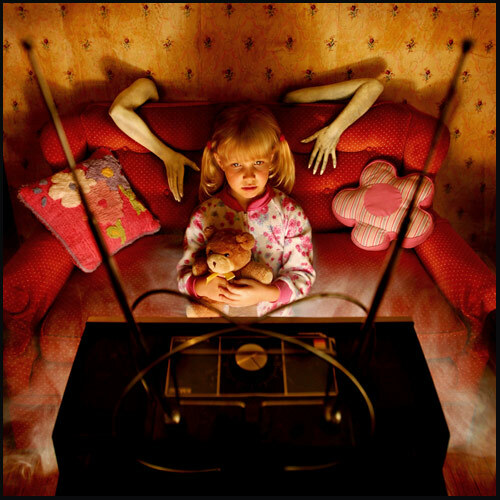 Many famous Horror films are closely related to classic fairy tales. PSYCHO draws heavily upon Little Red Riding Hood. Norman Bates, like the Wolf, dresses up as ‘grandmother’ before slaying his victim. Both stories are predicated upon the idea of ‘the wolf in sheep’s clothing’. Both the Wolf and Norman Bates adopt a mask of normalcy in order to hide their monstrosity and violent intent. THE TEXAS CHAINSAW MASSACRE is a modern-dress version of Hansel and Gretel. Only the kids in THE TEXAS CHAINSAW MASSACRE are lured into the witch’s house not by candy, but by their search for gasoline – an understandable motivation during the gas shortages of the 1970’s. The Horror film, like the fairy tale, also engages with what Bruno Bettelheim has called ‘the existential predicament’, where ‘a struggle against severe difficulties in life is unavoidable, an intrinsic part of human existence.’ While Bettelheim argues that the fairy tale has an inevitably optimistic outcome – the ‘happily ever after’ ending – the Horror film remains ambivalent in this respect. What it continues to share with the fairy tale, however, is a focus on the process of overcoming the dangers and obstacles in life. Fairy tales and Horror films need to continually construct problems for their protagonists to deal with. What the fairy tale teaches the child is that life will have difficulties, but they will be overcome. What the Horror film teaches us is that life will have difficulties, and they will be overcome, but that the process will then start over. In the modern Horror film, the monster always comes back, even after it has been defeated. Each stage of life presents it’s own set of dangers, obstacles, and difficulties. We never reach a plateau in life where everything is simply ‘happily ever after’. The process never ends. It continues until death. What are the most common fears? Pain, victimization, death, loss, and social collapse. Are present fears different than ancient fears? Are there specific fears of our era? The core fears are universal and perennial. Our primal fears redress themselves to fit any culture. Where are your images evolving to? What kind of scenes do you plan to shoot? Once your kids are older, who will be the protagonist of your scenes? Do you plan to shoot a kind of teen horror? I may continue to use my baby niece Thea for certain child-based scenes. But I do plan to use my daughters for a kind of teen horror. I just shot a new image called BABYSITTER, which stars my 13 year old daughter Arinna. There is a lot of potential in focusing on adolescence. Where do your pictures go? What kind of individuals buy your online prints? Where do you want your pictures to be hanged? I don’t know where my pictures go. I sell a lot of prints, but I never meet the buyer. These images were meant to be viewed in a gallery setting, rather than on a living room wall. I’m sometimes surprised that people want to live with them. Joshua Hoffine pasó mucho miedo cuando era niño. No es difícil imaginarle tendido en la cama, temblando a causa de algo que es imposible confundir con el frío. Sus ojos, desorbitados, se mueven en todas direcciones. Su frente se llena de sudor. Sus deditos están casi morados de apretar con fuerza el borde de la sábana, justo por debajo de sus ojos. Porque Joshua quiere ver. Pero Joshua tiene miedo. El miedo de Joshua, como una enfermedad, como una pandemia que se contagia a través de la mirada, que se inyecta en nosotros a través de sus ojos. Que se diluye en la sangre y hace que nosotros también veamos. A través de la obra de Joshua, vivimos de nuevo la primera vez que, arropados bajo las sábanas, nos dimos cuenta de que un día nuestros padres morirían algún día. De que el mundo no iba a cuidar de nosotros. Joshua nos lleva de la mano al día en que nuestra inocencia cayó al suelo, dando vueltas como un globo de cumpleaños vacío. Sí, Joshua nos lleva de la mano; y promete no soltarnos. Pero sólo cuando esa promesa se clava en nosotros, comprendemos que esa mano crepita y se estremece con las arañas que bullen bajo la piel. Entonces ya es demasiado tarde. Entonces comprendemos. Y algunos de nosotros, aceptamos. Las composiciones que nos presenta Joshua no son un simple espejo donde volver a recrearnos en nuestros primeros miedos. El hiperrealismo de sus imágenes es una garra que surge de la oscuridad bajo nuestra cama, tanteando para agarrarnos, para arrastraros a un mundo donde las sombras de las esquinas conspiran contra nosotros. En la habitación de Joshua, los monstruos no se desvanecen cuando se termina la película. Allí dentro cuando la puerta de la habitación se abre y aparece una silueta que recuerda a la de nuestra madre, nos damos cuenta de que tiene un cuchillo entre las manos. O quizá, sólo quizá, Joshua Hoffine no nos lleve a ninguna parte. Quizá, sólo quizá, Joshua Hoffine nos recuerde que ya estábamos en ese lugar. Quizá nunca hemos salido de él. Cuando era niño, Joshua Hoffine debió de pasar mucho miedo. La Galería de Arte Fotográfico Albertina tiene el placer de presentar las exhibiciones “Fuga de Entrañas” por Mariana Palova y “Escarbando Miedos” por Roxana Sagastume. 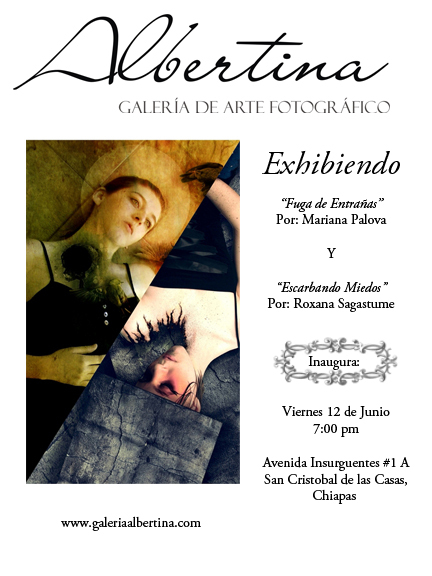 La muestra se inaugurará el 12 de Junio/09 a las 19hrs.